We knew this one was coming, but now it is official. The Big Red version of the HTC Snap, called the Ozone, just got officially announced! As it was rumored, the HTC Ozone will be available through Verizon’s business sales channels and online, starting June 29 at an affordable price of $49.99 on a two-year contract and after $70 mail-in rebate. In-stores availability begins July 13. The smartphone runs Windows Mobile 6.1 Standard and sports standard features for a business handset, such as front-facing QWERTY keyboard, Wi-Fi, 3G and large 1500mAh battery to safely get you through the day, 2.4-inch landscape-oriented QVGA display as well as 2-megapixel camera with autofocus and 128 MB of RAM/256 MB of ROM. Ugly. Should have kept the original style. i heard from a friend of mine who works for vzw this is going to have open GPS. This would have been the sweetest phone ever. 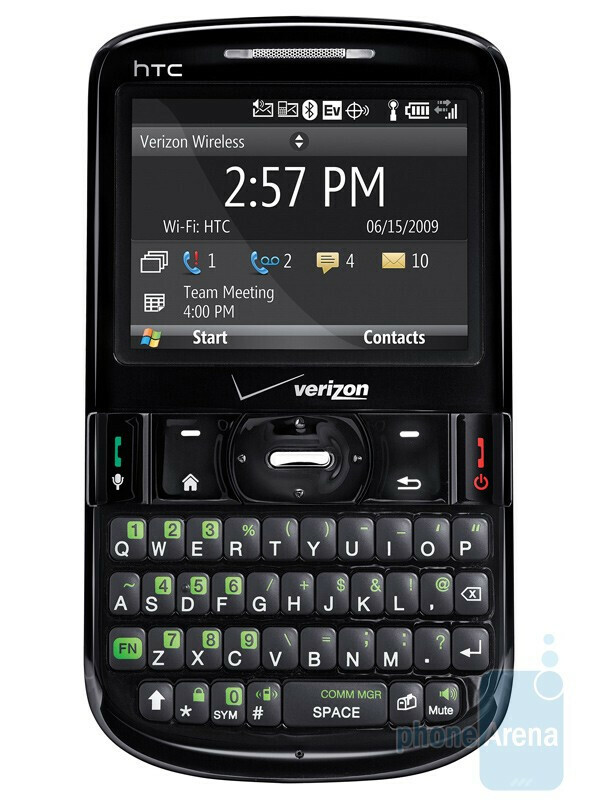 . . . . Had it launched the same time as the MOTOROLA Q9. ARE YOU KIDDING ME!!!! I love HTC but this is a joke right??? 2.0 MP camera (really cool 4 years ago), 128 MB (dont forget your memory card), The screen display in the picture looks like the same software the old "Q" series phones had 5 years ago. The only thing ive heard about this phone so far that is worth anything is the fact that it has Wi-Fi. But thats not really even a bonus when you have to have a data service anyways.. . . . .HTC is awesome, this phone is not. First off, the Q first launched 3 years ago (2006), not 5 years and secondly... this thing is only $50... FIFTY DOLLARS! Find me another smarthphone for $50 that has specs that match this phone. Maybe, just maybe, there are smarthphone users out there who don't need 5+mp cameras and such, and don't want to spend $200+ on a phone. God forbid HTC make a very affordable lower end smarthpone. I agree with elgee02. As a Verizon customer looking for his first Smartphone purchase, it's nice to see a smartphone that is under $200 on Verizon's network. AT&T has several devices running WinMo for cheap. It's not a touch pro, but it does email, syncs with outlook, and handles my scheduling. Some of us actually work on our phones. I agree too.. Even though I just switched and got my iphone today! This is a good thing Big Red. $50 for a PDA is unbeatable. Well fortunetly for me i believe in the theory "You get what you pay for." So if your looking to get the cheapest Smartphone have fun with that. If im going to pay a minimum of 29.99 extra per month (on top of my regular phone plan) to have a smart phone regardless of which one . im certainly not getting a 50 dollar smartphone. Your talking about saving money look at the long term and what your getting for your dollar. They going to require monthly internet service with this thing? It has WiFi, Quad-Band GSM, and auto-focus on the camera, all of which the Sprint Snap lacks.